In Places Deep: Serve the Master! A fool once said that magicians are "either diabolists or cowards" for even though he was a fool he knew the Power offered by the beings of the Pit outstrips that which can be learned from study alone. But what is the cost of the Power? The only true Way to Power is to submit oneself to the will of a Dark Master. While this means the loss of one's Will, many see it as superior to scrounging in the dirt for arcane secrets and being limited by the Laws of Reality. To make a pact with with a Dark Master, one must first summon it into the World. The rituals for this are usually and unfortunately very simple, but they only have a percentage chance of succeeding equal to the supplicant's Charisma + Level. After it has first been summoned, the caster may call the Dark Master again at double this percentage chance. Summoning is a dangerous process. The supplicant must roll a d20 under their Wisdom score in order to have accurately prepared the protective wards necessary to survive contact with a Lord of the Pit. If they fail to do so they are either dragged to the Pit or hideously transformed, depending on the nature of the Master. For example, Armadeus takes men in a puff of greasy, sulfurous smoke while the Horned One turns them into mindless deer-men. When making a pact, the supplicant must submit to the Service required by the Master. This is not to be done lightly, but once a Lord of The Pit is summoned they rarely leave without their pound of flesh. In addition to making pacts, summoned demons may also teach spells. This requires a sacrifice the total HD of which must be equal to three times the level of the spell or a sinister task created by the referee with the campaign in mind. Entering into a pact changes the character's alignment to Chaotic automatically, if it was not so already. Being taught a spell changes the character's alignment to the next alignment towards Chaotic, so Lawful characters become Good, Good characters become Neutral, etc. Anti-clerics may not enter pacts as the Dark Masters are already the source of their Power. Here are the mechanics for the three most common pacts witches and sorcerers are likely to enter into in the Dark Country. Armadeus is the master of secrets, shadow, and in some texts the Undead. The supplicant must write his Secret Name in Armadeus's Black Book in order to receive the Power. Once he has done so, he will automatically fail his saving throw against any effects caused by the demons in Armadeus's twenty and seven legions. The supplicant receives a familiar in the form of a black cat with piercing green eyes. Once per day, the familiar will reveal the location of a hidden thing to the supplicant. The familiar spirit may also be dismissed to search for the Secret Name of any creature. This process takes one full day for Chaotic creatures, one week for Evil ones, one month for Neutral creatures, and one year for Good creatures. There is only a 50% chance of success with Neutral creatures and a 25% chance for Good creatures. The familiar will never learn the name of a Lawful creatures. If the supplicant learns the Secret Name of a creature in this fashion, any saving throws made by the creature against effects caused by the supplicant are at a -4 penalty. The supplicant may retreat into his shadow once per day, becoming two dimensional and immune to non-magical weapons during this time. While in this form he cannot attack or manipulate three dimensional objects, but he only has a 2 in 6 chance of being noticed by those who did not see him transform. To exit this state, the supplicant must make a saving throw. On a success, they emerge from their shadow. If they fail, they must remain in their shadow for a full day. After three failures, the supplicant is stuck forever as a shadow and becomes an NPC with the statistics of the shadow described in the S&W Monsters booklet. The supplicant may use their knowledge of a person's - but not a creature's - Secret Name to enthrall them. To do this, they must make eye contact with the person and the person must make a saving throw at the -4 penalty conferred by knowing their Secret Name. If they fail they are in the thrall of the supplicant until Dispel Chaos is cast on them. If the supplicant should die and the person is still enthralled, the victim will seek to resurrect the supplicant in any way possible. The supplicant may have up to two thralls +/- their Charisma modifier. Crapoad is the Father of Toads and Font of Blasphemies. The supplicant must accept a toad into his throat. This toad will exist parasitically off the supplicant, and thus the supplicant will require twice the amount of food and water normally needed by humans. If this diet is not met, the supplicant shall not gain any benefit from natural healing. In addition to this increased need for food, any time a spell is cast by a Cleric in the sight of the supplicant, the toad will belch a hideous blasphemy that has a percentage chance of negating the spell equal to the supplicants Charisma score. The supplicant gains a toad as a familiar. This is not the same toad that lives in his throat. Once per day this toad will reveal the location of any text the supplicant can describe, including a spell scroll. Once per day the supplicant may see through the eyes of any toads within the five mile hex they currently are in. In doing so they automatically find any locations, persons, or creatures that are outside, assuming the weather is amenable to toads. While searching in this way, the supplicant's body is in a catatonic state. A saving throw is required to exit this state. After three failed saving throws the supplicant's mind is switched with that of a toad and he is sent to wander among the bog as his body hunts for worms and flies to eat. The supplicant may "silence" a cleric by causing any utterance - including attempts to cast spells - to come out as some hideous blasphemy or heresy. This requires eye contact and the sign of the evil eye to be made at the cleric, at which point the victim gets a saving throw. The effect lasts until a successful save dispels it, with a new save allowed every sunrise or until Remove Curse or a similar spell can be cast. The Horned One is the Master of Beasts and of the Lusts of Men and Women. The supplicant must submit to the Horned One's hideous advances, After the initial pact is made, all of the supplicants hit die are rerolled until a lower number is achieved. This becomes the new HP total for the supplicant until they gain a level. There is also a 30% chance the supplicant, regardless of gender, becomes impregnated with 1d3 devil-men as describe in the post on the Horned One. The supplicant must renew the pact every year at a Black Sabbath held on Candlemass Eve. When this occurs the HD are again rerolled, though only once and the lower of the two HP totals is taken, meaning their may be no change. There is also, again, a 30% chance of becoming host to 1d3 devil-men. The supplicant gains a black goat as a familiar. This goat, at any time, may lead the supplicant to the nearest community of beast-men, devil-men, witches, or werewolves. This is easy as these often cohabitate. These beings will also know the supplicant as a friend. The familiar also speaks the secret language of beasts, and once per day will translate for the supplicant. He will under no circumstances teach this language. Once per day, the supplicant may summon 2d6 hit die worth of beasts or beast-men - the type of which is determined by the refree and the number of which is determined by the hit die. These creatures attack anyone in the immediate area of the caster. The supplicant, and anyone aligned with him, must make a saving throw or be assaulted themselves. Good and Lawful characters always fail these saving throws. Once their quarry has been slain, they will return from whence they came. The supplicant may, once per day, turn 2d6 hit die worth of persons into beasts or beast-men, caster's discretion. There is no limit to the HD affected, but a saving throw is allowed. In addition to the other traits gained through pacts, each Dark Master makes its Mark on the supplicant. This becomes more pronounced as the supplicant levels. The individual marks are omitted from this post in order to prevent the Nightwick playgroup from metagaming. I like it! Very cool. 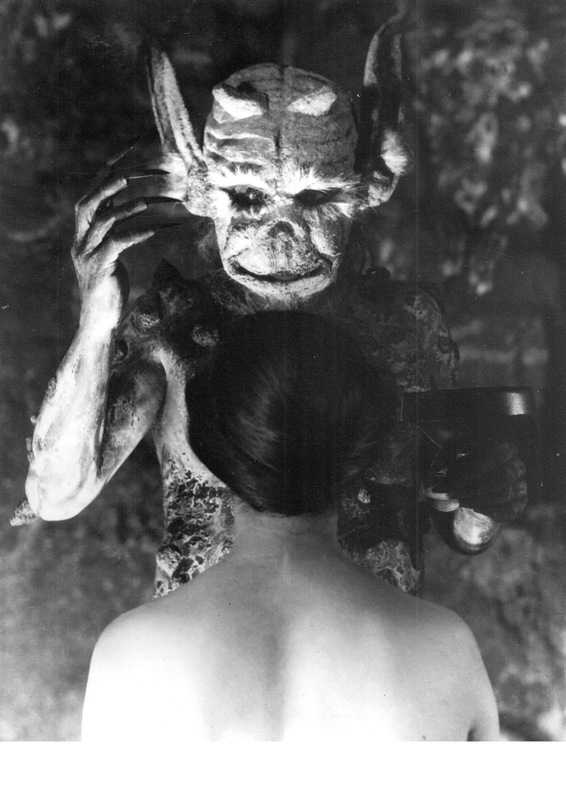 And mad props on the use of the Häxan art too. Thanks for the introduction to Purson! Wow!